Haiyan Lee, The Stranger and the Chinese Moral Imagination Stanford: Stanford University Press, 2014. vi, 362 pp. $50.00. ISBN: 9780804785914 (cloth); ISBN: 9780804793544 (ebook). 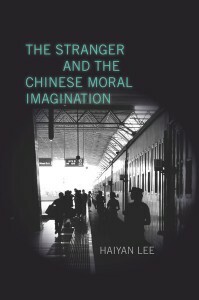 In the introduction to her Strangers and the Chinese Moral Imagination, Haiyan Lee lays out an ambitious theoretical framework for investigating the border zones of “self and other” in Chinese literature, a figure she calls the “stranger.” Lee’s definition of the stranger follows Georg Simmel’s notion of “the wanderer who comes today and stays tomorrow—the potential wanderer, so to speak, who although he has gone no further, has not quite got over the freedom of coming and going” (10). The “stranger” for Lee opens up an ethical discussion in Chinese literature of class, gender, race, ethnicity, and ideology and treats a wide variety of literary and cultural texts. Those texts range from literature to television, public exhibitions, and film where the lines between self and other become legible in the figures of ghosts, animals, women, domestic servants, sent-down youth, racialized class enemies, migrant workers, and, of course, foreigners. Lee uses these encounters to chart the historical, evolving relationship between what she calls Confucian “kinship sociality” and “stranger sociality,” an evolution the author sees as essential for developing a robust civil society in China. To underscore the importance of developing a stronger civil society in China, Lee begins the book with examples of moral breakdown. She notes “two consecutive hit-and-run incidents in a narrow market street that left a toddler girl named Yueyue lying in a pool of blood, crushed, inert, and ignored by over a dozen passers-by.” She relays a gut-wrenching synopsis of Blind Shaft, a film about unsuspecting migrant workers killed for their life insurance payouts. She discusses public signs admonishing travelers “not to talk to strangers,” and these episodes set the stage for Lee’s primary notion that the moral failings of the public sphere “have roots in both the Confucian tradition of kinship sociology and the modern state management of stranger sociality” (2). Lee argues that neither the received Confucian kinship morality nor the “state management of stranger sociality,” paradigmatically embodied by Lei Feng (a model soldier who selflessly serves the people), have been able to offer a moral foundation for China’s urbanizing population. She argues that the Party has “furnished the alibi for the state-sponsored suspension of stranger sociality and the attendant atrophy of the moral imagination” (2). There is hope, however; Lee shows the potential of literature (as well as film, TV, etc.) to incubate and nourish an “emerging civil society that can and should sustain moral proximity, wherein the face to face is cultivated by individuals qua individuals and wherein rules and sanctions are a mater of negotiation rather than imposition” (29). Lee encourages readers to think about how reading literature and other forms of cultural production will bring attention not only to the historical conditions that undergirded “kinship sociality” in the past, but also to how and why many sociologists still label Chinese society “low trust” today. Like Lee, many sociologists wonder aloud what might be done to usher in a more organic Chinese civil society in the future. The book is organized into three parts: “Alien Kind,” “The Benighted and the Enchanted,” and “Friends and Foes.” Part I explores important moments in modern Chinese literature where “superstitious peasant beliefs” in ghosts, spirits, gods, etc. embed peasants and minority groups within a traditional cosmology that “makes them and their deities strangers to secular modernity” represented in the figure of the modern intellectual narrator (31). Lee argues that these literary moments draw readers’ attention to the fact that “modernity does not have all the answers to existential questions” and that banishing such superstitions can paradoxically expose these vulnerable groups to “the predation of uneven development” (31). Part I then continues in this vein by tracing out how human-animal relations become indexical to a wider paradigmatic shift from the premodern vertical cosmic order (where animals could be viewed as “marvelous creatures with fabulous powers”) to the modern order in which they are helpless victims of human development, reduced to pets, game, livestock, etc. (31). Part II begins with chapter 3, “The Power and Pollution of the Stranger Woman,” which explores the gendering of strangers within the Confucian kinship sociality, and continues with chapter 4, “The Country and the City,” where the evolving encounters between urbanites and the migrant working class (maids, transient tenants) in Chinese cities or the experiences of sent-down youth in the countryside reveal how Chinese urbanization is transforming discourses of civility on a personal, narrative scale. The final section, “Friends and Foes,” is comprised of chapters that explore the evolving discourses of the stranger as “enemy.” The book ends with a conclusion entitled “Literature and the Veil of Ignorance,” which for this reader failed to deliver on the promise of the earlier chapters. Throughout the book, Lee offers fresh and illuminating readings of canonical texts like Wu Cheng’en’s Journey to the West, modern best sellers like Jiang Rong’s Wolf Totem, Mo Yan’s Life and Death Are Wearing Me Out, and Gao Xingjian’s Soul Mountain, films like Blind Shaft, and television serials such as 28 Maids at Professor Tian’s and Nannies for Foreigners. Each reading offers genuinely productive insights into historically-specific moments where encounters with outsiders both structure and disrupt existing gender, race, class, and ethnicity commitments. While the introduction could have benefited from a deeper engagement with questions of moral agency highlighting the tension between human agency as individual ethics vs. a collective historical dynamic (a point I will return to), any one of Lee’s individual chapters make up for these missed opportunities. While all six chapters ostensibly focus on one particular register of “strangers,” each builds upon the next, revealing a multi-vectored reinforcing network of othering. Take for instance Lee’s critical reading of Jiang Rong’s novel Wolf Totem, where she shows how the novel’s ostensibly clear demarcation line between human and animal others actually conflates species and ethnic scales of otherness (wolves and Mongols) to reveal a “profoundly Han-centric and anthropocentric” hearkening “back to the century-old racial-nationalist question: how can China attain wealth and power and avert the fate of extinction in the Darwinian jungle” (109). Or chapter 5, “The Enemy Within,” arguably the book’s most powerful chapter, wherein Lee reveals how concepts of class and ethnic/racial difference became conflated in ways that expose how the logic of “racism” need not hinge upon biological notions of difference. The buoyant rigor of Lee’s prose outweighs the occasional awkward turns of phrase in these chapters (a fault I would find more with the editors than the author) but still falls flat in the conclusion with an awkward invocation of Roland Barthe’s binary of writerly vs. readerly texts. I was left scratching my head at Lee’s unproved assertion that “writerly” (disjunctive, non-linear, or otherwise non-absorptive) works are somehow complicit with authoritarian “commitment politics,” whereas the more absorptive “readerly” texts can offer a moral theater within which a civil society can be practiced and strengthened. I am on board with the idea that fully absorbing narrative prose can enable us to experience morally challenging situations, but there are strengths offered by so-called writerly texts that are not only ignored here but excluded with such a reductive choice. Despite this awkwardness, Lee’s conclusion does communicate a vision for an engaged humanities, one where literary criticism can validate its value propositions against the encroachments of big data and other structures of knowledge gaining strength in academia and beyond. Hegel’s argument hinges on the idea that history progresses through a dialectical relationship among the family (kinship), the state, and civil society and that the Chinese culture at present (ca. early nineteenth century) cannot extend ethics beyond the substance of the family to the state. Hegel’s model reduces ethics to filial obligations and deprives people of moral subjectivity (differentiation), the required ethical conditions for developing modern civil society. Rather than unmasking the reductive teleology of such logic that measures sociological progress along a continuum toward a culturally coded definition of progress, this reader instead found these recalcitrant paradigms reaffirmed and emotionally redoubled. No longer excluded from dialectical “progress,” according to Lee, Chinese literature can serve as a powerful tool to help “evolve” Chinese society away from the problematic non-individuatedness of Confucian kinship sociality toward models that we associate with the West’s idea of modern liberal democracy. To help make the stakes of this problem easier to grasp, imagine for a moment reading a work of literary criticism that started with a spattering of horror stories drawn from the more-seedy corners of America’s nursing home industry followed by an analysis that reads these incidents as causally linked to the dominance of “stranger sociality” (or lack of kinship sociality). Now imagine that readers are asked to see these behaviors as existing on an evolutionary continuum where the outmoded worldview of stranger sociality can no longer cope with societal changes more capably addressed by Confucian filial piety/kinship sociality. The fact that we can reverse the poles of such dichotomies not only reveals the existence of a reductive cultural logic at play, but perhaps more importantly reveals a need for a more nuanced comparative cultural framework that acknowledges both shortcomings to be avoided and strengths to be drawn on when addressing contemporary (trans-cultural) social phenomena. In the example above, it arguably calls for a deeper, more complete study of causes of ageism without relying on ideologically-coded indices, especially those emanating from a single culture or world view. I would argue that Levinas would have been a more fruitful framework for Lee than the sociological one she ultimately chose to frame the book as a whole if only because a larger treatment of Levinas would likely have come with a wider canvas of Levinasian studies in China. Citing key arguments in works like the 2008 volume Levinas: Chinese and Western Perspectives (edited by Nicholas Bunnin, Dachun Yang, Linyu Gu) would have provided the kind of nuanced theoretical background able to match the rigor we find in Lee’s powerful close readings. Finally, it is worth restating how right Lee is to insist on placing literature and literary criticism at the heart of the challenges facing China and the West. Because interpretation puts forward a thesis and marshals supports to back it up, we are forced to foreground the argumentative nature of our work and we do this by rigorously engaging our own motivations as deeply as the ideologically contingent, culturally- and historically-specific discourses being interpreted. There is certainly no reason to avoid drawing on the tools of sociology, for instance, as long as concepts like “stranger” or “kinship sociality” are employed with an understanding of their dependence on the very dynamic potentiality of our own cultural contingencies (not separate from them). In other words, literature and literary criticism may not be an ideal place to validate or disprove hypotheses developed by sociologists, but we should feel free to engage this work as long as we resist falling into the evidential logic that condition their conceptual limitations. Having said this, there are few literary critics better prepared to carry out this work than Haiyan Lee, as she has proven by her keen interpretive analysis here and elsewhere, and I am looking forward to her next work.